Anthony Watts claims in the headline that "The IPCC has been Deceiving the Public about the Carbon Cycle from the Start". His so-called "evidence" is provided by his guest blogger Ari Halperin. Ari is an uber-conspiracy theorist in the style of Tim Ball. Ari is the one who suggested that the people who murdered Justice Scalia could have escaped over the border to Mexico. He's also the one who offered deniers a custom Google search bar so that they could avoid contaminating their climate science denial with anything vaguely science. Many people hold the opinion that the early full reports of the IPCC Working Group I were scientifically wholesome, at least for some time. This might be true for some parts of the reports, but their treatment of the carbon cycle was fraudulent from the start, i.e., from the IPCC First Assessment Report (FAR, 1990). Is CO2 sentient? How does it know which queue to get in, faster or slower? “Because of its complex cycle, the decay of excess CO2 in the atmosphere does not follow a simple exponential curve … For example, the first reduction by 50 percent occurs within some 50 years, whereas the reduction by another 50 percent (to 25 percent of the initial value) requires approximately another 250 years” (FAR WGI, p. 8). The authors of this text did not explain how CO2 knows when it is in the “first reduction” and when it is in another one, which is supposed to take five times longer. This ideation is not grounded in any scientific evidence. It sounds as if Ari believes that CO2 molecules have an innate ability to choose. He wonders how they know which queue to get in, the faster lane or the slower fast lane. That opens up some wondrous opportunities for the discovery of as yet undetected sub-atomic-sized complex neural masses in simple molecules. Such a shame he doesn't elaborate. Of course Ari's assertion that there is no evidence that CO2 decay doesn't follow a simple exponential curve is nothing more than a dumb assertion. As an aside, I don't know why it is, but I've noticed that some deniers have a penchant for avoiding the most recent science and referring to science written 25 years ago. Here is a diagram from the latest IPCC AR5 WG1 report, which illustrates what would happen in an idealised situation if a very large pulse of CO2 were to be shot into the air. "There are possible processes on land which could account for the missing CO2 (but it has not been possible to verify them). They include the stimulation of vegetative growth by increasing CO2 levels (the CO2 fertilization effect), the possible enhanced productivity of vegetation under warmer conditions, and the direct effect of fertilization from agricultural fertilizers and from nitrogenous releases into the atmosphere." (FAR WGI, p.13, emphasis is mine). It takes very warped thinking process to interpret the above clear statement of possibilities as "disregarding" those possibilities. I wonder if Ari knows that he'd never have found out that "CO2 is plant food" except for scientists who discovered this? What Ari doesn't do is show the carbon budget as represented in the most recent IPCC report, so I will. The science has come a very long way since 1990. The complicated diagram below is put forward as a simplified schematic. Click to enlarge it. 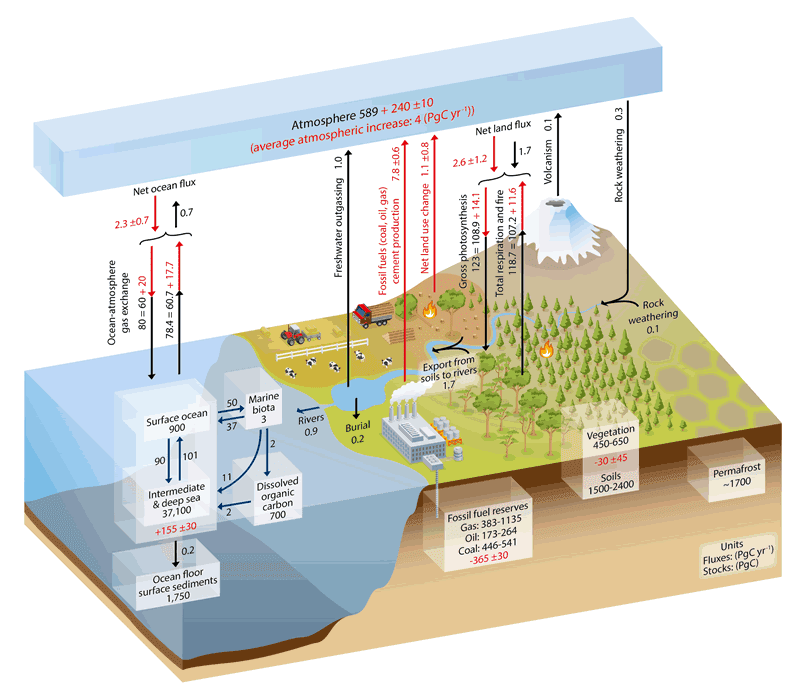 Figure 3 | Simplified schematic of the global carbon cycle. Numbers represent reservoir mass, also called ‘carbon stocks’ in PgC (1 PgC = 1015 gC) and annual carbon exchange fluxes (in PgC yr–1). Black numbers and arrows indicate reservoir mass and exchange fluxes estimated for the time prior to the Industrial Era, circa 1750. Red arrows and numbers indicate annual “anthropogenic” fluxes averaged over the 2000–2009 time period. Source: Fig 6.1 of Chapter 6 from IPCC AR5 WG1 report. For a simplified schematic, it certainly has to have one of the longest and most complicated captions in the entire report. I've only included very short excerpts. You can read the lot in Chapter 6 of the AR5 WG1 report if you want to see the detail. Where did human emissions come from and go to? The report indicates that we added 545 PgC to the air between around 1750 and 2011, with 155 PgC being absorbed by the oceans and 150 PgC being absorbed by natural terrestrial systems (areas not affected by land use changes). I couldn't find any simple table similar to that in FAR in the latest IPCC report. The diagram below is probably the closest. It shows the emissions and their sources from 1750 to around 2011, and what happened to them (absorbed by land and ocean sinks, the atmosphere etc). 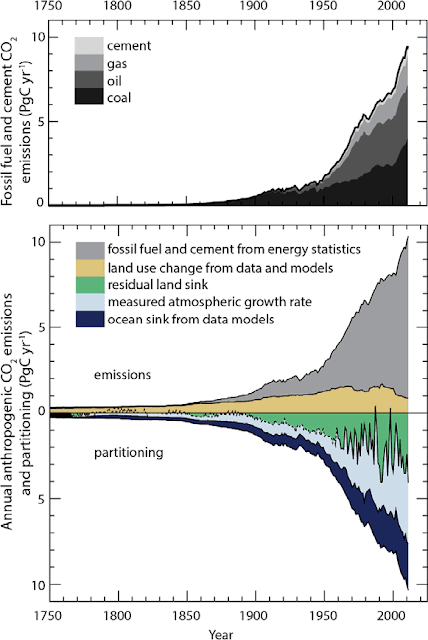 Figure 4 | Annual anthropogenic CO2 emissions and their partitioning among the atmosphere, land and ocean (PgC yr–1) from 1750 to 2011. Source: Fig TS.4 from IPCC AR5 WG1 report. Once again, the caption in the IPCC report has a lot more detail. It's in the Technical Summary of the IPCC AR5 WG1 report. This episode sheds light not only on the carbon cycle treatment, but also on the IPCC’s epistemology in other areas. It decides which empirical facts to acknowledge and which to ignore, and makes up whatever it needs. Since the early 1990’s climate-related research has been allocated huge budgets, and it produced a large volume of results of various quality. That allowed the alarmists to cherry pick not only data, but even physical processes. The presence of honest scientists put some limits on these machinations, but the alarmists found ways around that obstacle. The "episode" he is referring to is the fact that back in 1990, scientists had not yet worked out where all the CO2 emissions were ending up, but were able to state some likely sinks. What he thinks is that back then the scientists should have been able to put a number on everything. I don't have a clue what caused him to think that. He doesn't say. For each gas in the table, except CO2, the lifetime is defined here as the ratio of the atmospheric content to the total rale of removal. This time scale also characterizes the rate of adjustment of the atmospheric concentrations if the emission rates are changed abruptly. CO2 is a special case since it has no real sinks but is merely circulated between various reservoirs (atmosphere ocean biota) The lifetime of CO2 given in the table is a rough indication of the time it would take for the CO2 concentration to adjust to changes in the emissions… (FAR WGI, my emphasis. 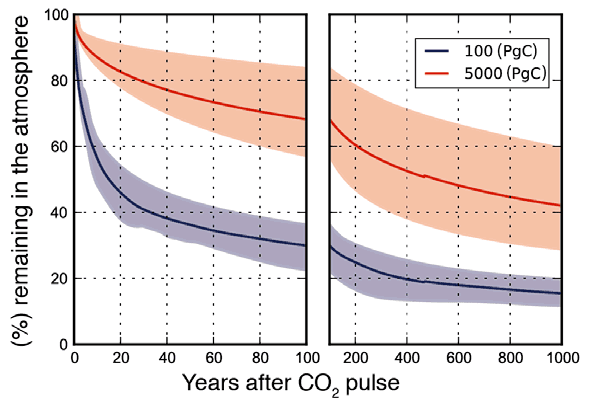 Table 1.1 gives the CO2 “lifetime” as 50 200 years). No real sinks? How about the ocean? Is it not real, or has “it been impossible to verify that it was real”? A relatively minor point is that the word “reservoir” is subtly misleading, because it suggests a fixed capacity, while the capacity of the ocean and biota are flexible and increase with the increase of CO2 concentration in the atmosphere. So he thinks that reservoirs always carry the same fixed quantity. He hasn't seen the Hume Dam in flood or drought. Much of the rest of his article is wacky conspiracy theorising. (I'm guessing English isn't his first language because he shows an inability to comprehend fairly simple passages.) Ari talks about "semantic trickery", "dishonest calibration", "politically important “scientific conclusions”" being "proven wrong" and more. The ‘airborne fraction’ (atmospheric increase in CO2 concentration/fossil fuel emissions) provides a basic benchmark for assessing short- and long-term changes in these processes. Glossary, AR5: Airborne fraction [means] The fraction of total CO2 emissions (from fossil fuel and land use change) remaining in the atmosphere. ...the “airborne fraction” is not a fraction. Outside of math, the word fraction suggests a quantity between 0 and 1. The “airborne fraction,” as defined by the IPCC, can be anything from -∞ to +∞. For example, if anthropogenic emissions decrease and become half of the sinks, the airborne fraction would be -2 (in the absence of other natural factors). Why does he say it's not a fraction? All a fraction is, is a part of the whole. In this case, it's the proportion of CO2 emissions that remain in the air. Why does he talk about "outside of math"? Fractions are inside of mathematics, not outside. If emissions dropped so much that more was absorbed by the oceans and land than stayed in the air, then that's a good thing, surely. I can live with a negative annual airborne fraction. Of course the total airborne fraction (since 1750) will be positive for thousands and thousands of years regardless of what we do. Finally, the “airborne fraction” is physically meaningless, because annual CO2 sinks are practically independent of the annual anthropogenic emissions. That's plain wrong. The amount absorbed by the oceans, for example, is related to the partial pressure of CO2 in the atmosphere. If there's less, then less will be absorbed and vice versa. Residence time is usually defined as the average time that a molecule resides in the system under consideration. The residence time of CO2 in atmosphere is about five years. IPCC probably meant not the residence time, but something like “e-folding time of excess concentration,” but wanted to avoid any hint of exponential decay. So it came up with tortured language and a flatly wrong statement. Okay, let's laugh at Ari. The time for an individual carbon atom to stay in one place (the air or the ocean or a plant for example) is considerable shorter than the time it takes for there to be a net movement of carbon from the atmosphere to the surface. Since Ari picked on the word "residence", think of it as sub-letting vs a vacant apartment. A person rents an apartment and then moves out but sublets the apartment to someone else. So the apartment remains occupied. Then the original tenant moves back in and the sub-letter moves out. As long as the apartment is occupied, it is not vacant. There is no net movement. The ins balance the outs. It's only when the apartment falls vacant that the residence time stops. That's what Figure 2 up top is all about. 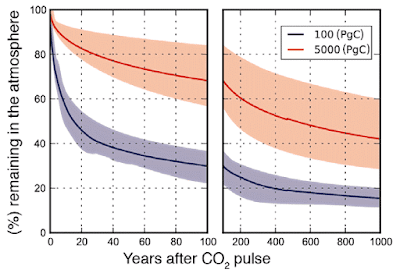 It shows how long it takes for there to be an overall reduction in atmospheric CO2 after an injection. If there's anyone still not convinced that in a steady state system, a molecule leaving the air is replaced by a molecule coming into the air, try this. Pop into your pantry and get some food dye. Fill one glass jug with water. Add a couple of drops of food dye - call that the atmosphere and the food dye CO2. Then fill another jug with the same amount of plain water as you put in the first jug. Call that the ocean. The atmosphere jug should be coloured from the food dye. The ocean jug should be clear colourless water (depending on your water supply). Pour half a cup of the water from the atmosphere jug into the ocean jug. Then pour half a cup of water from ocean jug into the atmosphere jug. Repeat steps 6 and 7 for a while. Eventually if you do this for long enough, you'll find that the colour of the water in both jugs is about the same. Can you tell which bits of food dye went from one jug to the other? Does it matter? The "residence time" of an individual molecule of food dye in one jug or the other is irrelevant to the colour of the water in each jug. The colour of the water indicates how much total food dye is in each jug, it doesn't matter whether an individual molecule ever left the first jug. What matters is that enough food dye molecules were exchanged between the two jugs to even things out. 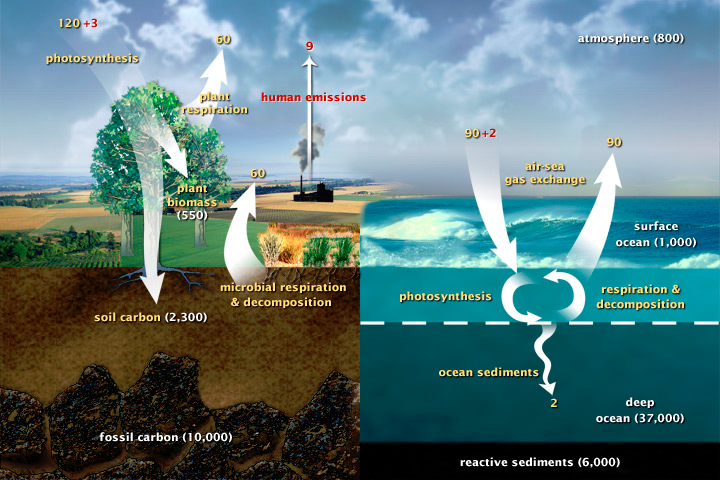 In the Earth system, carbon atoms move between the ocean, the air and the land surface (including soil and plants etc). As more and more CO2 is poured into the atmosphere, more also goes into the oceans and land, and out again circulating into the air. It's not a one-way trip. There's probably a point at which the biosphere starts to absorb a lesser fraction of emissions, and maybe the oceans too. Then things will really start to heat up. Thus, every IPCC report can be compared to a garbage bin in a public square: delicious leftovers from good restaurants are thrown together with rotten fruits and sprinkled liberally with bird feces. One might take a look at the bin to see what sort of food is served in a nearby restaurant, but eating from the trash is not advisable. Some distinguished scientists contributed to the IPCC reports, especially the WGI, but their work lost all value when it was mixed with alarmist viewpoints. That tells you all you need to know about WUWT. This article is already way too long but let me show you the type of audience WUWT attracts these days, because Anthony Watts posts silly articles like Ari Halperin's, claiming that the carbon cycle is a hoax. Early on there was a bit of to-ing and fro-ing about whether scientists are intelligent or not. I didn't see anyone commenting on the lack of intelligence at WUWT. It is not like the scientists involved are not intelligent. They are. It is just that they chose to tell the scary story rather than the true accurate one. The airborne fraction will probably fall below Zero at some point since the Carbon sinks will be greater than our emissions at some point in several decades. Yes. ‘radioactive’ half life is different than ambient concentration half life. Individual CO2 molecules presumably have no memory. So some deni&rs confusing molecular half life with concentration half life. PLEASE stop this warmunist targetable mistake. BUT, the best studies on carbon sinks put the latter (relevant for CAGW) at at most ~50 years. Still a very large IPCC fail. And worthy of several serious rebuttal sound bites. If all CO2 sources stopped, then 1/2 of all CO2 in Earths atmosphere will be removed in 10 years. That is by direct observation of the so-called “bomb 14C” tracers curve. Well I measure the half life of CO2 in the atmosphere; actually the decay time constant, by the observed annual cycling of CO2 abundance in the atmosphere as recorded at Mauna Loa and elsewhere. At ML, the annual cycling is about 6 ppmm on top of about a 1-1.5 ppmm steady annual increase. North of the Arctic circle, this annual growth is about the same (CO2 is well mixed they claim) but the annual cycling is between 18 and 20 ppmm. Now that 6 ppmm drop or 18-20 ppmm drop takes place in just 5 months, and it grows back in 7 months. So if we take the CO2 excess over the long term stable 280 ppmm as being 120 ppmm, then at the initial polar drop rate, that would all be gone in about 6 x 5 months or 2.5 years. At ML it would be three times that long or 7.5 years, so that is the exponential decay time constant. If the cyclic process was not terminated after five months, but continued to act, then in five time constants 99% of the exces CO2 would be gone. Or 95% would be gone in three time constants or 7.5 years (polar) and 22.5 years at ML. So 200 year residence times are just silly. The atom bomb tests involved 14C not 12C or 13C, so just what evidence do we have for the take up times of 14C in other environmental processes. If plants can segregate 12C from 13C, then why would we suppose that 14C uptake would match either of those. The bottom line is that CO2 concentration in the atmosphere is still increasing. Until that changes, AGW will continue. Yep. Still rising, only the temperature is not. Besides, it is shown that CO2 levels lag GW. Therefore CO2 does not cause GW. Is this some new meaning of “Not Rising”? It has never really been about CO2. CO2 is just a fabricated control knob for the desired U.N. global energy control and distribution mechanisms. Great essay. Terrific documented forensic analysis. The Bern model implicitly assumes carbon sinks saturate. Land greening (satellite NVDI by ecosystem) and decades of phytoplankton surveys (especially Atlantic permanent sink ‘chalk’ formers recently published) have shown observationally this warmunist assumption is simply not true. Wagen must be new to WUWT. Someone needs to let him or her know that Anthony Watts specialty is false allegations of fraud, wacky conspiracy theories, and blanket denial of climate science. ..Try reading the article child, or do you have a reading comprehension problem on top of being stupid ? Is there CO2 under my bed? How long will it be there??? Denying one meaning of the word fraction means Ari has become a fossil fuel denier too. How ironic. "Using common sense and basic business skills (such as source checking), I tried to find a scientific basis for the global warming/climate change alarm, and found the opposite." "Elsewhere Mr. Halperin states he is a "gentleman scientist"..."
Sorry Ari, but'gentlemen' do not go about accusing others of fraud without good evidence. And any 'scientist' worth the name ought to be able to understand the IPCC report, and certainly would not garbage like this WUWT article. presumably all in an afternoon too!!! A reference to this 2012 comment by Ivar Giaever, I assume? I am not really terribly interested in global warming. Like most physicists I don't think much about it. But in 2008 I was in a panel here about global warming and I had to learn something about it. And I spent a day or so - half a day maybe on Google, and I was horrified by what I learned. "never underestimate what can be achieved with a glass of wine, a cigar, a free afternoon and google"
I do most of my best google with a cigar and a glass of scotch. The wine must have been what he did wrong. Yeah - and how do the Earth's oceans "know" where the Moon and the Sun are? The whole "tidal forces" thing in astronomy is an obvious fraud. Tide comes in. Tide goes out. You can't explain it. How does the bob on a pendulum know when to accelerate/decelerate? Its a mystery fraudulently explained by consensus following fools who claim to solve it using Newton's laws of motion plus some strange thing called gravity. And gravity, as all gentlemen scientists know, relies on sentient apples for its existence. And my thermos bottle: it keeps hot things hot and cold things cold. How does it know??? I like it. Don't suppose you can get more reductionist than that. "After a rattled Anthony Watts spat out dummies yesterday"
An amusing discrepancy between British and Australian vs. American English here. It would be a positive but entirely improbable development if WUWT spat out 'dummies' in the U.S. sense of the word. My first thought on reading that line was that WUWT had told people like Ari they were no longer welcome. I guess the equivalent to spitting out dummies is shooting blanks? Magma's correct. The usual saying is "spat the dummy". A not dissimilar saying is that someone "picked up their marbles/bat and ball and left/went home/ ..in a huff" meaning he started the game, got sick and tired of getting beaten at his own game, so he took back his toys and left. Interesting, isn't it? On Facebook there frequently arise posts about 'crazy British English no-one else understands', but as an Australian I invariably have not the slightest difficulty with any of them and usually use them regularly myself! Our American cousins have certainly drifted further linguistically from the mother country, though I understand may 'Americanisms' are actually older English anachronisms. There's also the amusing " '...ize' is an Americanism", while the Oxford dictionary will tell you otherwise, depending on whether the word has a Greek or Latin derivation! Surprized me! Or to throws one's toys out of the pram. Anyone who has studied the basics of oceanography knows that the ocean is divided into two vastly different sections. The warmer surface water layer "floats" above the thermocline which separates the denser, near freezing, deep water below. That division is a reflection of the fact that there's relatively little circulation between the surface layer, which is around 100 meters deep, and the rest of the ocean water. The deep water is continually re-replenished with cold water sinking in the polar North Atlantic and around the Antarctic by the thermohaline circulation. The timing of the THC flows have been demonstrated with various tracers, such as 14C and CFC's measured in the deep waters. The time required for the flow from sinking to return to surface is hundreds to thousands of years. If anyone seriously wants to go down this line, I have a one word instruction. Don't! A few minutes reading the true believers of the particles are conscious rubbish shows just how deep the well of stupidity really is. Freeman Dyson's thinking is very muddled. At the atomic level and below particles follow the laws of Quantum Mechanics. Not only does a particle not 'know' where it is until it has an interaction, it also does not even know what energy it has, as it can borrow energy from the future to enable quantum tunnelling. Our sentience or consciousness could be due to the vast possibilities of states available to the atoms that make up our organised at a molecular level brains. In fact consciousness seems to emerge from the infinitely vaster number of possible states due to quantum effects. Try to picture a hundred billion probability functions all collapsing at once due to processes in your neurons. These probability functions are spread out through all space. Yes your consciousness is everywhere a bit thin in most places but finite. I am convinced the brain relies on quantum effects for its function. We shall find out when we finally build complex quantum computers. It has already been shown beyond doubt that photosynthesis, enzyme action and navigation in birds rely on quantum effects. In fact the ability of a small robin to 'see' the Earth's magnetic field relies on the most elusive of all quantum effects i.e. entanglement. "I am convinced the brain relies on quantum effects for its function." My first novel was based on this idea. Sadly, it is now out of print. The carbon atoms in my brain say that's complete gibberish, but the oxygens aren't so sure. The hydrogens are keeping their opinions to themselves, as usual. Magma that is quite logical as the carbon atoms can bond with each other and others. A bit like footy players. Don't touch my wallet and/or my wife. Oxygen just bonds with anyone with free electrons so it is a bit promiscuous. The hydrogens are just hangers on. They have one lonely electron to share. No real prospects in other words. You might be interested in Mindful Universe, Quantum Mechanics and the Participating Observer by Henry P. Stapp, which makes that very argument. Brandon, I am quite content to accept the role of quantum effects in biological systems (Life On The Edge by Al-Khalili and McFadden is on my to read pile), I just think some people who overestimate their own ability take the quantum concept and stretch it to far. There is no need to hypothesise that a molecule has consciousness. By the way, your suggested reading does look interesting. I feel a purchase coming on. Thanks for that clarification. I agree that those who tend toward woo creatively interpret QM to mean that the universe itself is conscious. Stapp's work was too technical for me to completely follow, but he did explicitly make the argument that he thinks that neurobiology has tended to downplay quantum effects in brain structures and gave one specific example of how ion channels in our synapses must induce quantum uncertainty, and therefore cannot be considered a deterministic process. Fascinating work, I don't think you'd regret the purchase. I should have been clearer on quantum consciousness - you're right, I meant the woo idea that the whole universe is one interconnected conscious entity. I got stuck trying to follow Penrose's ideas on consciousness and quantum ideas many years ago. I will definite give your recommendation my best shot. I spent some time a couple of years ago arguing with a woo merchant about the consciousness of inanimate objects. I was told to read something by a name I've thankfully forgotten. When I looked deeper, the fake scientist had plucked a non-existent subatomic particle out of his imagination as a means of carrying consciousness around the Universe. No real explanation - it just had to be so because... Reminded me of all sorts of fake explanations for anything but carbon dioxide. Reading reviews of Stapp's book tells me he is the genuine article. The "participatory universe" is just an idea for an idea by Wheeler and others I believe. Fair enough as a hypothesis, lets see if anyone can find evidence for it. A related idea I think is if our universe grew out of a singularity, then all quantum particles could be entangled in some way as they all existed in the same place. This idea is probably nonsense as it is possible no particles existed at the instant of the singularity, they were created later. I think the woo-woo sets in because of the use of English - eg a particle is said to have "decided" to be a wave or a particle, this sloppy use of language implies the particle has a consciousness to be able to "decide". In reality it doesn't "decide", the particle is actually undefined until it is measured. Personally I believe the universe fundamentally has no purpose. Watts unearths another amateur pamphleteer with a paranoid streak. Halperin is so damaged by PTSD from his life under the the communists that he can't read straight, quoting unambiguous referenced IPCC material and coming to fearful conclusions about motivation. The whole scribbling is a cry for help. The jug experiment is about the most excellent everyday experience description I've read of how exponential rates of equilibration work. Brandon, thanks. It can also be used to show how difficult it is to remove the food dye/CO2 after you've added it, short of geo/kitchen-engineering (tipping out all the water and starting over). Good point. Entropy is not our friend on that score. All your biological processes in cells and between cells rely on diffusion for transport. These motions are purely random yet we live to argue. It is only when the scaffold of the organising molecules fail to operate correctly do you die. These molecules control the movement of molecules into and out of cells. I do not have time to explain it all up to your vascular system etc as I do not understand it myself. If I had to define life I would say that it used the energy available in the Universe to increase order locally at the cost of increasing the Universe's Entropy. It is the equivalent of heat going from a cold body to a hot body. It can also be considered as a disorder to order as far as information is concerned. In other words we are just very complex large packets of information. Entropy is not our friend as we by merely existing create more of it. My kidneys get rid of waste soluble products still, after all these years. Unfortunately our Spaceship Earth needs time to rid itself of our waste. It does have mechanisms for this, but they are a lot slower than the rate we are polluting our environment. "It is widely supposed that one has to capture the CO2 from the flue gases of coal-fired power plants, cement factories or oil refineries. This is misconception. All molecules of CO2 are identical, so one should aim for the most economical way to capture as much CO2 as possible anywhere in the world, independent of location or origin. The atmosphere is a well mixed reservoir, so capture of CO2 around a dunite mine in a tropical country reduces the CO2 level of the entire atmosphere of Earth just as much as capturing the same amount of CO2 from the flue gases of a power plant in Western Europe." But I'd never thought of this, even though it's so devastatingly obvious once you read it. (Schachtschabel et al. 1982, Sumner, 2000).This is due to the fact that plant material is decaying, and soil fauna is breathing, both increasing the local CO2 content." My response was Well, der! when I eventually read it properly. re. residence time, a simple analogy that practically everyone should get is the following. Suppose the average residence time of a shopper in a shopping centre is half an hour (well that as much as I can usually take!) does that imply that an hour or two after opening the shopping centre will be empty for the rest of the day?